To keep your rooftops secure and employees safe, GSM Roofing offers rooftop safety solutions SafePro. We can retrofit a fall protection system onto your existing roof hatch, without any penetration and without affecting your roof warranty. You’ll have instant compliance – and peace of mind. Most workers keep roof hatches open while on the roof – unaware they’re violating OSHA standards. 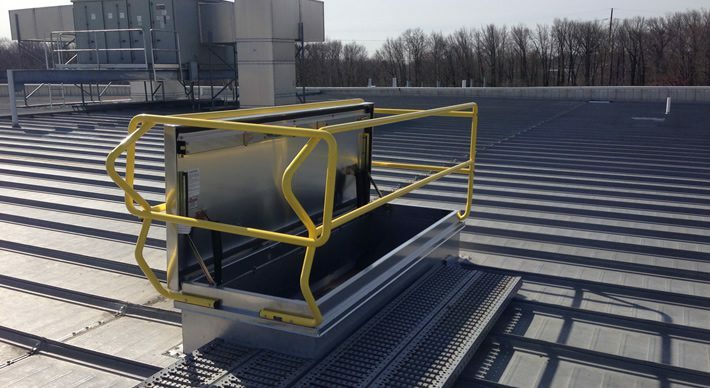 Installing SafePro’s Roof Hatch Safety Rail delivers safety and instant OSHA compliance. The four-sided rail system features ergonomic handgrip side rails, self-closing gate with no pinch hinges, and ladder extension rails that hold steady in the event of a slip. No more fumbling around in the dark to lock your roof hatch. SafePro’s HandsFree Power Lift™ automatically locks/unlocks, opens/closes and latches the hatch door when a user-programmed code is correctly entered into the keypad. The solar-powered system includes a wireless remote to operate from inside the building. An electric 110V option is available, along with an optional magnetic card reader. Ready to talk about safety roof hatches?